I was incredibly honoured to be elected to Parliament this May, and I’m determined to fight for the best deal for my constituents under this Conservative Government. My constituency, Edmonton in North London, is a place of huge contrasts and inequality. There’s prosperity but there’s also real poverty, and areas with some of the highest unemployment levels in the country. I’ve spoken with so many local people doing their best but still struggling to get by and worried about the future. Regeneration activity is crucial to bring new jobs, as is better education, health, and transport – and it’s my job to fight for better opportunities and living standards for local people. As a Labour and Co-operative Party MP, I also firmly believe in solidarity with others fighting for a better life, whether it’s in this country or on the other side of the world. Visiting relatives in Nigeria taught me from a young age that people share the same aspirations, whether they’re struggling local entrepreneurs in London or in Lagos. It was a Labour Government that set up the Department for International Development back in 1997, and I’m committed to pushing for the UK to be a force for good in people’s lives wherever they live. This means knowing what’s happening on the ground – and if the 0.7 pence per £1 of national income spent by the UK on aid is working or not. 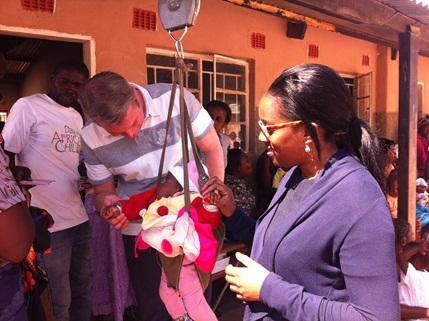 So last month, I joined MPs from across the political parties in visiting Zambia with the charity RESULTS UK, to find out how UK aid money is being invested in health. There are many things needed for a country to improve living standards, but the evidence shows that spending on health – from family planning to disease prevention and nutrition – can be one of the most high-impact, cost-effective ways to make a long-term difference. Before coming to Parliament, I spent 15 years working in the NHS for a GP Co-operative and more recently as a Surgery Practice Manager. I‘ve seen first-hand how people are held back if they can’t get the care and services they need – and why we need to fight for the NHS in this country. What I saw in Zambia on my very first day in the capital city, Lusaka, reinforced this. At a local Government-run clinic in George Compound, a poor, inner-city area, the queues stretched out of the door. Young mothers sat with their babies, quietly waiting all day. Heidi, the young sister in charge and our host, explained that one doctor was on hand to treat 1,000 patients a day, in a small area covering 120,000 people. I shouldn’t have been surprised – after years of colonial under-development and post-independence instability, Zambia is a still very poor country. Its recent re-classification as a ‘Middle Income Country’ obscures the fact that increasing copper prices and extraction have pushed up some high incomes, whilst the vast majority of people remain poor, with unmet basic needs and without secure work. Zambia is the ninth most unequal country in the world. Donor countries like the UK should be very careful about withdrawing aid from such countries, assuming the need has gone down, or that Governments are already in a position to collect and allocate enough taxes to step in. It would be like pulling away the rug, just when there’s a chance of working with Governments to create more equitable growth and development. But for this to happen, of course Governments must do more. We asked several people how much of Government spending goes on health – including the Zambian Minister for Health, an intelligent man and clearly a skilled politician who is very aware of creating ‘too much demand for the supply’ he receives from his Treasury colleagues – and received a different answer each time, of between 4-11%. Each answer was below the recommended 15%. 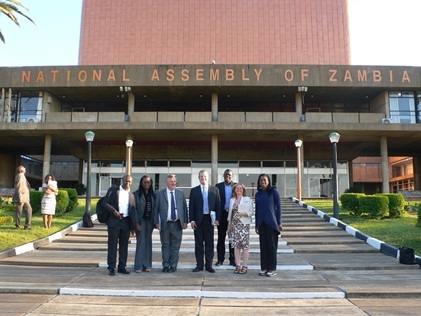 The UK Government must pressure their opposites in countries like Zambia – and support civil society campaigners like we met from health pressure group ‘CITAM+’ – to make sure spending goes up as quickly as possible, including by supporting better tax systems and tackling the outrage that is international tax avoidance. Equitable development means reaching everyone, especially those who need it most – and this often means investing in women and children. I’m passionate that all women have the right to avoid a life of repeated pregnancy, poor health and poverty. The UK Government is right to prioritise women and children’s health – it must now press others to follow this lead, and to make sure that the poorest and hardest to reach women and their children are targeted. Women will be quick to respond to such opportunities: at a mobile vaccination clinic at the local rural school, run by UNICEF and supported by a UK-funded global initiative called Gavi, the Vaccines Alliance, the mothers had set up an impromptu market and were earning extra cash while they waited for their babies to be immunised. The results achieved by Gavi are huge – the number of child deaths a year has halved since it was set up in 2000, and as we saw in Zambia, these immunisation sessions also give doctors the chance to share family planning advice. There are big challenges in a country like Zambia. One is the sheer size of the country, and it was heartbreaking to hear nurses at a rural hospital speak of the young dad whose son died in his arms just as he arrived at the hospital following a two day walk. 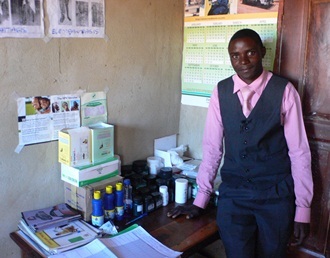 The UK is helping here too, training an army of new rural Community Health Assistants. We were bowled over by the commitment and care of 23 year old Elias, a quietly spoken but inspiring young man who was so proud to have been selected for the job of running his local health post, providing basic health advice and commodities to rural homesteads. It is vital that this sort of work to strengthen health systems is sustained – prevention is so much better than crisis, as we have seen in the tragedies of HIV and Ebola. Diseases of poverty like HIV/AIDS and tuberculosis present another huge challenge. HIV affected 12% of all adults at its peak last decade, and again it has only been through global initiatives such as the UK-funded Global Fund to Fight AIDS, TB and Malaria, that this has now dropped. But countries like Zambia still face a huge treatment bill, and will need better ways of protecting their people in the long-term, such as an HIV vaccine and better TB drugs and vaccines. 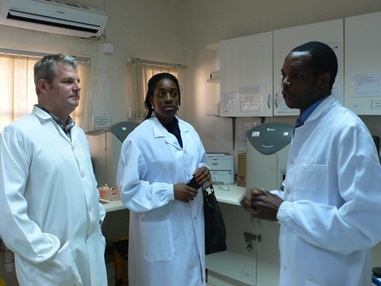 We met with Dr William Kilembe and his team of Zambian scientists working for the International AIDS Vaccine Initiative in their Lusaka laboratory, and with the team at Aeras who are working on a new TB vaccine. The science they’re working on is world-class, but it can’t continue without strong global support. We’ve reached a point where diseases like HIV and TB are no longer automatically a death sentence in places like Zambia, and now have the opportunity to push for the end of these epidemics. This is worth remembering when people tell you things ‘can’t be done’ – especially in December, when the Global Fund will begin its next call for funding. Reflecting on the challenges I saw in Zambia, it seems important to remember what we’ve achieved in just the last fifteen years. Annual child deaths cut by half around the world, saving 6 million children’s lives a year. 15 million people on HIV treatment and 37 million deaths from tuberculosis prevented. Life expectancies increasing and helping to raise incomes and living standards. Looking at these numbers, it’s clear that UK aid and partnerships are something to be proud of. I’d say it’s worth keeping up our work with people like Heidi, Elias, and Dr Kilembe, and committing to do our bit to tackle poverty and inequality, whether it’s found in the UK or much further afield.